The first full weekend of May was chock full of key series throughout the nation – as various teams solidified their postseason positioning while others remained firmly on the bubble for a potential NCAA Tournament at-large berth. Also CLICK HERE for similar rundown of key midweek games for May 4–6, 2015. Scroll down for complete rundown of all weekend action within the CB360 Top–50 Composite National Rankings, plus additional result info. for projected NCAA Tournament teams from conferences not in the current Top–50. As always, also be sure to follow only via Twitter – @CB360updates – for details, notes, etc. from key results. • Marathon Heartbreak & Sweep-Avoding Win – After a heartbreaking, 17–inning loss in the early hours of Sunday morning, Arizona State (cb360 #16) – which lost its series the previous week at Cal –bounced back to edge  UCLA in the 2–1 series finale (averting a Bruins sweep). That result left UCLA (18–6) with a three-game lead atop the Pac–12 (ASU, Cal and USC all are 15–9) – with two series remaining. • Cards Soar Over ‘Noles –  Louisville won the ACC showdown series vs. visiting  Florida State, as the Cards (23–4) have clinched the ACC Tournament top seed in runaway fashion (Miami is 19–8; FSU 17–10). Louisville also became more firmly entrenched as a potential top–8 national seed, following the big series win. • National Seed Implications? –  Florida and  Vanderbilt both are in the mix for a top–8 national seed (inside track to hosting Super Regional) and those teams met over the weekend in Nashville, with the Gators overcoming a gm–1 loss to win the pivotal series. Head-to-head results rarely play a huge role in NCAA seeding/selection … but in this case, the two Florida wins over Vandy could prove to be huge in determining if either gets a coveted top–8 national seed. • Hooo Won, you ask? – It was a sweep for  Rice at  Florida Atlantic, in the Owls–vs.–Owls series that pushed Rice (20–7) atop the Conference USA standings, ahead of Middle Tennessee (19–8) and FAU (17–10). Florida Atlantic was being projected as a potential NCAA Regional top seed (top–16 in the 64–team field) but certainly still has some work to do in order to solidify that status. • Titanic Series Win – Yet another showdown series was playing out in Southern California, and  Cal State Fullerton won the first two games en route to the series win vs.  UC Santa Barbara. Two other teams in the mix for the Big West title – Cal Poly at  UC Irvine – also met over the weekend, with UCI winning 2-of-3. As a reminder, the Big West automatic NCAA bid goes to the regular-season champion … with two series remaining, Fullerton & Irvine both sit at 13–5, UCSB is 12–6 and Cal Poly 10–8 (CP’s only shot at the NCAAs is the auto. bid). • CofC Wins CAA – Sticking to the showdown series theme for one more early-May matchup,  College of Charleston left no doubt en route to a sweep of visiting  UNC Wilmington. CofC – which won the 2014 NCAA Regional at Florida (as that site’s 4–seed) – already has secured the 2015 Colonial Athletic Association regular-season title, at 19–2 (UNCW is 15–6). • Another Huge Sweep for Irish –  Notre Dame – which had gone only 6–8 since its huge series sweep of Florida State – was firmly on the NCAA Tournament bubble before responding with another sweep of a top ACC team,  North Carolina. The Irish had riden their pitching staff in the earlier sweep of FSU while more solid pitching – plus a blitz of clutch home runs – helped deliver the sweep of UNC. Late home runs from Jake Shepski and Ryan Bull powered ND’s comeback from a 5–2 deficit in the series opener (10–5 final), before a 5-home-run assault launched the Irish to the series-sweeping victory (8–7; with Cavan Biggio’s HR preceding the tying run in the 8th, and Kyle Richardson’s blast winning it in the 9th). • Shell Uncracked – One week after being swept by Illinois,  Ohio State had a chance to bounce back but visiting  Maryland took 2–of–3, helping ease the Terps off the NCAA bubble (for now, with Maryland’s RPI improving from 51 to 38). • SEC Road Rally – With time running out to improve its NCAA resume, South Carolina responded big-time by winning its series at  Texas A&M. Elsewhere in the SEC, Alabama also delivered some huge results by sweeping its series at arch-rival  Auburn. In another intense rivalry series,  Mississippi swept visiting Mississippi State. The Rebels boast a solid RPI and the nation’s top strength of schedule – but Ole Miss had been in danger of finishing sub-.500 (ineligible for NCAA at-large bid). Following the rivalry sweep, Ole Miss now sits four games over .500 (28–24). Unlike the three teams highlighted above,  Kentucky took a step back by losing its home series vs. Georgia. • … SEC Tournament Chase – Following the key series mentioned above (plus Tennessee splitting two vs. Arkansas), it’s still a tight four-team race for the final two SEC Tournament spots (determined by win pct. ): Alabama 11–16 … Georgia 9–17 … Tennessee 8–18 … Mississippi State 8–19. • Midwest Bubble Teams –  Bradley lost 2-of-3 in its home series vs. Illinois State while  Nebraska suffered a costly home series loss vs. Purdue (rpi–195). Two weeks ago, the Huskers owned the nation’s 20th-best RPI but now sit at 45 (after being swept at Iowa, losing a game at Northwestern and then dropping the series vs. the Boilers). • All or Nothing? – The American Athletic Conference featured two head-to-head series between NCAA bubble teams: as Tulane won 2–of–3 vs. visiting  South Florida while UCF (Central Florida) won its own home series vs.  Memphis. All four of those teams – or none of them – could find themselves in the 2015 NCAA field two weeks from now … as could yet another AAC bubble team,  East Carolina (which lost 2-of-3 at league leader and cb360 #20 Houston). • Olé: Toreros Take WCC – San Diego – a couple weeks removed from being swept by San Francisco – continued its rollercoaster season by winning its home series vs. Pepperdine. USD (19–8) has clinched the WCC regular-season title, ahead of the Waves and Dons (both 15–9). 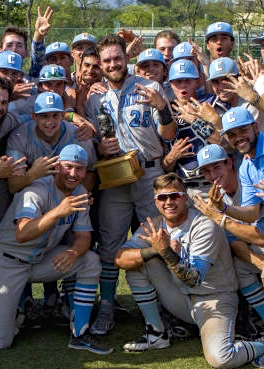 • Lions Snare First NCAA Bid – Columbia became the first team to claim an NCAA automatic bid (pictured at right), after winning the Ivy League Championship Series vs. visiting Dartmouth. … The Patriot League semifinal series saw both of the home teams advance (each in 3 games): top seed Navy vs. Lafayette and 2–seed Lehigh vs. Holy Cross. • Jags Keep Rising – Surging South Alabama – following series sweeps over Georgia State and Georgia Southern – added another key series win, after taking 2–of-3 at Louisiana (Lafayette). The Jags (19–8) now sit atop the Sun Belt standings, followed by Troy (17–10) and Georgia Southern (16–11). • MAAC Scramble Continues – In a matchup between two Metro Atlantic (MAAC) top teams, Rider won 2–of–3 vs. visiting Quinnipiac (done w/ conf. play at 15–9/.625). The victorious Broncs sit atop the MAAC standings at 13–5 (.722) … with the five teams still in the running also including Monmouth (13–8), Canisius (13–8) and Siena (11–7). Final-week series include: Monmouth at Rider … Siena at Fairfield … and Niagara at Canisius. • A–10 Musical Chairs – The Atlantic–10 – another league with numerous title contenders – saw Saint Louis win 2–of–3 at George Washington … leaving three teams (SLU, Richmond and Rhode Island) deadlocked atop the standings at 14–7, followed by GW (13–10; done w/ conf. play) and Davidson (12–9). The final-week musical chairs will play out via the following series: St. Louis at St. Joseph’s … La Salle at Rhode Island … and Richmond at Davidson. gm–2 (Sat.) – ppd to Sun. gm–3 (Sun.) – ppd to Mon. gm–1 (Fri.) – ppd tp Sat.